The Attendance Boundary Committee (made up of staff, parents and community members) has been meeting to develop a contingency plan in the event a final decision on school closures be delayed or overturned by the court of appeals. Read more and view the plan. We’re forming a Superintendent’s Advisory Council to bring together people with different perspectives to talk about a common interest – our students. Learn more and complete the interest form. About a dozen special education students and alumni attended the 11th Annual Adapted Flag Football Game put on by the Ponies Football team. Players led the student-athletes through a variety of football drills at Pony Stadium. 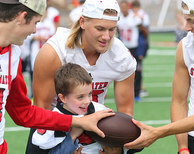 Participants had the thrill of scoring a 30-yard touchdown run against the Ponies defense, while a live play-by-play was announced over the loudspeaker. For more pictures visit the team's website at goponi.es/2dkoz7a. Our junior highs will soon become middle schools and they'll need new names. School board policy requires a building's name to match the programming - meaning the junior highs have to be renamed as middle schools. Submit your ideas and read frequently asked questions about the name change. 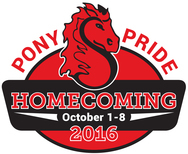 Homecoming is a time for all district students and residents to join the fun and show their Pony Pride! Join us in celebrating our exceptional students – past and present – during Homecoming Week, October 1-8. Look for area businesses who will be painting their windows with Homecoming messages and come cheer on our students at a variety of events and activities all week long. View the calendar and learn more. For more information on the forums visit our website. Join us at the Ponies Football game on Wednesday, October 19 for a “Crank It Like a Chainsaw” halftime spectacular! The Stillwater Physical Education Department is inviting all elementary students and their families to participate in the 3 minute dance routine. Our goal is to have more than 1,000 students on the field, under the lights and in front the Stillwater community promoting physical activity and healthy living! For more information visit our website. Adventure Club is looking for people who enjoy spending time with children and are available to work morning and/or afternoons. Working at Adventure Club is a great way to make a difference in the lives of elementary children and work in a fun team environment! We have two positions: assistants (must be over 18) and aides (must be over 16). Apply online.